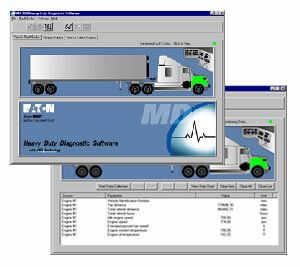 The MD-300 series PC Diagnostic Software quickly diagnoses Heavy-Duty commercial vehicle electronic systems. It uses the SAE J1587 diagnostic link and a uniqe Windows® based intuitive graphical interface. The MD 300 offers three diagnostic functions in one software package including data monitoring, fault codes and reports. The software tool operates on Windows 95, 98, 2000 and XP. The software can record vehicle information, fault activity and repair procedures. This information is collected and stored as a Vehicle Service Report. The MD 300 software application requires an RP-1210a compliant communications adapters for vehicle diagnostic.